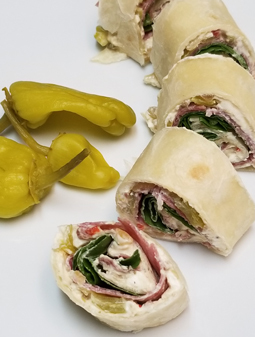 Spicy Salami Pinwheels - A recipe from Savor California, the online showcase for extraordinary gourmet foods and beverages from California. Drain relish in a colander. Blend relish with cream cheese. Spread relish-cheese mixture over tortilla. Sprinkle a few peppers down center. Cover tortilla with a layer of salami. Top with a few fresh spinach leaves. Roll up and wrap with Saran Wrap. Chill until ready to serve. Cut into sections about 1-1/2 inch wide.